Proximity to nature helps us unwind and relax in peace. A green surrounding is so essential for your home. Even a small garden has immense capabilities of beautifying the façade of your home. But today’s city dwellers are not so lucky to have sprawling lawns in their houses. So today we will share with you some ideas that you can implement in smallest of spaces and design a charming garden for your house. 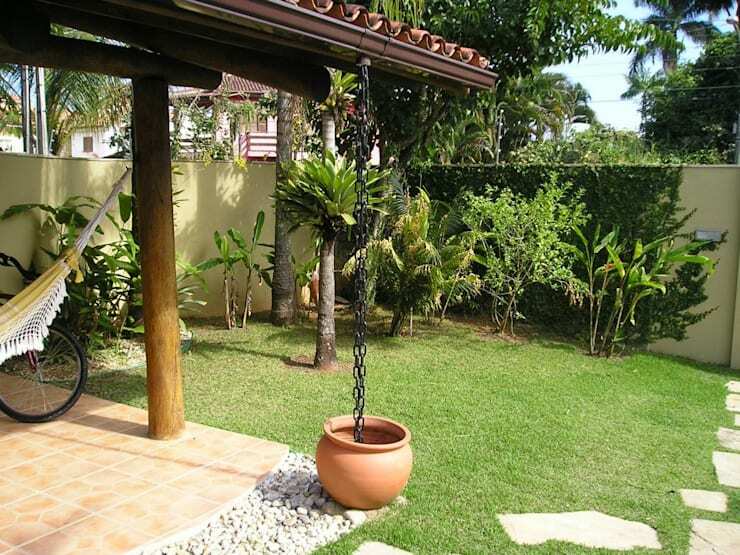 The design of this backyard shows a tropical charm. It is small and simple. But that does not fail to attract anyone. The yard merges beautifully with the patio. The wooden rafters along with terracotta tiles on the roof increase the rustic appeal. The ground is simply decorated with an array of banana and palm trees. 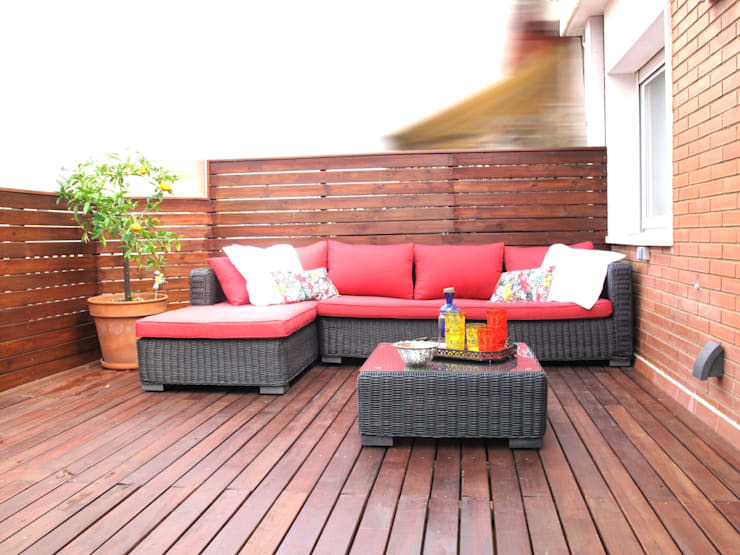 Wooden deck can be such a beautiful addition to your house. It induces a warm feeling in the interior atmosphere. Owing to its varying colour and texture, wood is perfectly capable of increasing the beauty of your dwelling. Use simple rattan outdoor furniture to decorate your wooden patio and enjoy sitting there in peace. Check out some of our relaxing terrace design ideas. 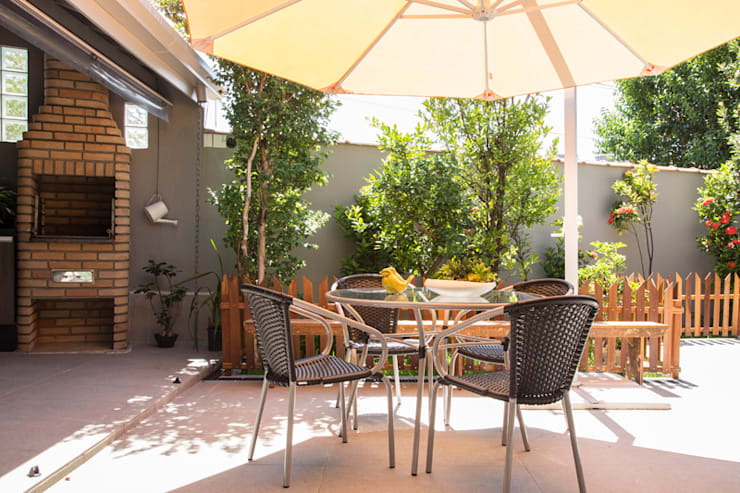 It is not difficult to build an outdoor dining area in your house. Take inspirations from this outdoor space and see how the interior stylist decorated the space in a delicious way. Lightweight metallic furniture is set in the middle of the patio. The edges of the ground is decorated with numerous plants that add colour in this space. Can you imagine the feeling of walking barefoot on a lawn like this? The space is further decorated with numerous garden plants and a winding pathway. A combination of stone and brick has been used to build the boundary walls. The cheerful sunshine acts as a sole embellishment for this courtyard. It is design with wood flooring. A single tree with colourful foliage occupies the focal spot of this area. The living room can be accessed from the courtyard itself. You have already seen quite a few patios designed with wood flooring. This one uses irregular stone slabs to deck up the flooring. 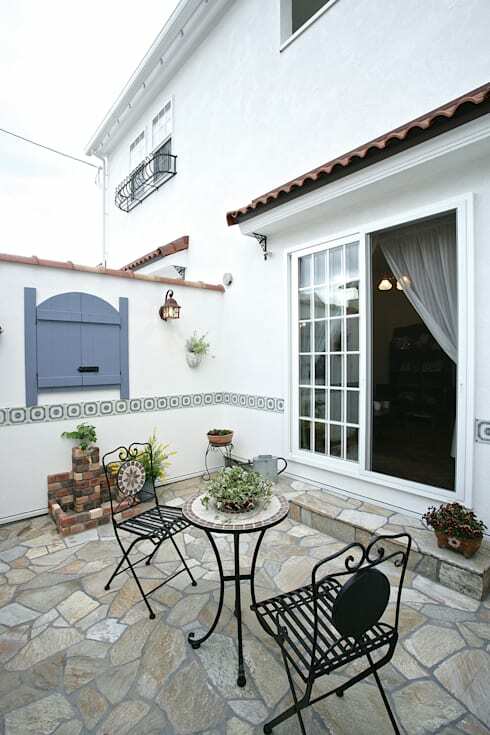 Wrought iron outdoor furniture occupies the central point of this Mediterranean patio. The white façade and boundary walls are decorated with stucco and simple ceramic tiles. 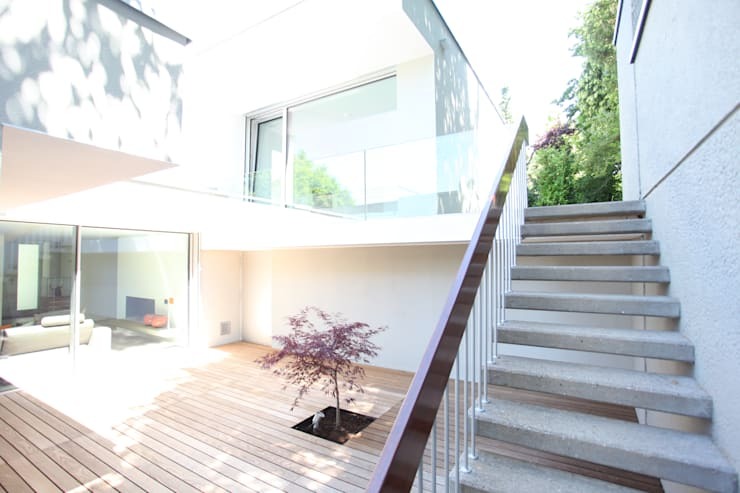 The contemporary design of this patio and backyard makes it perfectly suited to the modern homes. The patio itself is low and designed with natural wood flooring. You can step across the green lawn decorated with several plants and large trees anytime you like. Or, you may simply loll on one of the several reclining chairs placed on the wooden deck. 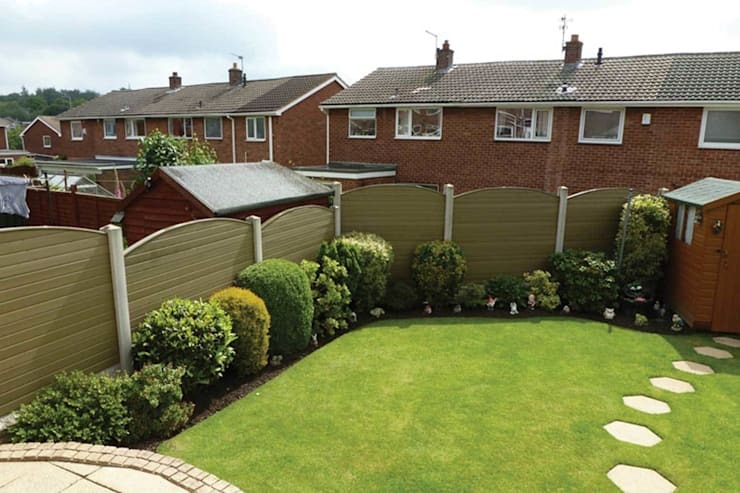 The small backyard of this house is secured by wooden boundary walls with an interesting design. The garden itself is decorated with lush green lawn and small hedges along with the walls. 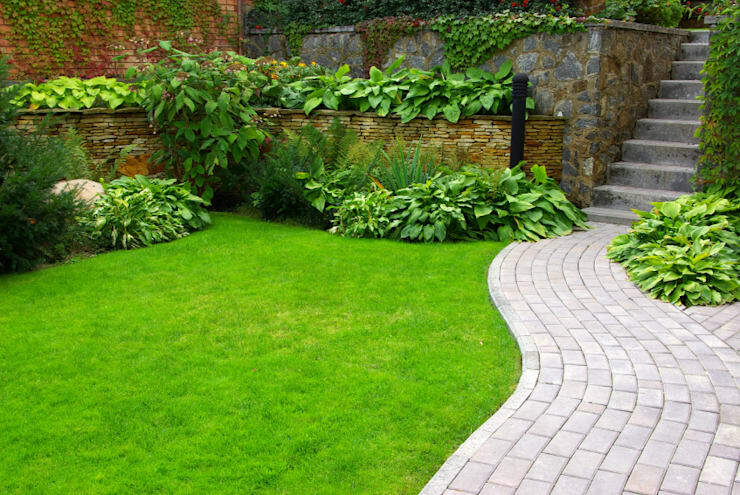 To decorate a similarly stylish garden, have a talk with an expert landscape designer. 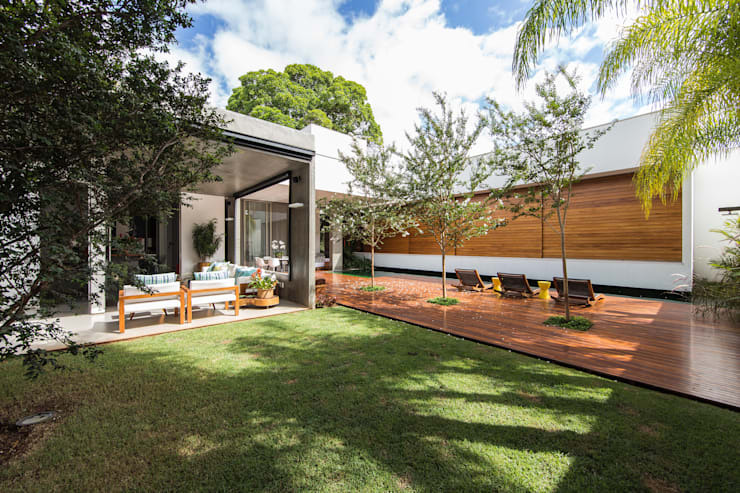 This garden has everything you can dream of in your home – a simple modern pergola, children’s play area, a place to sit down and relax and a garden pond to maintain the balance of your garden ecosystem. 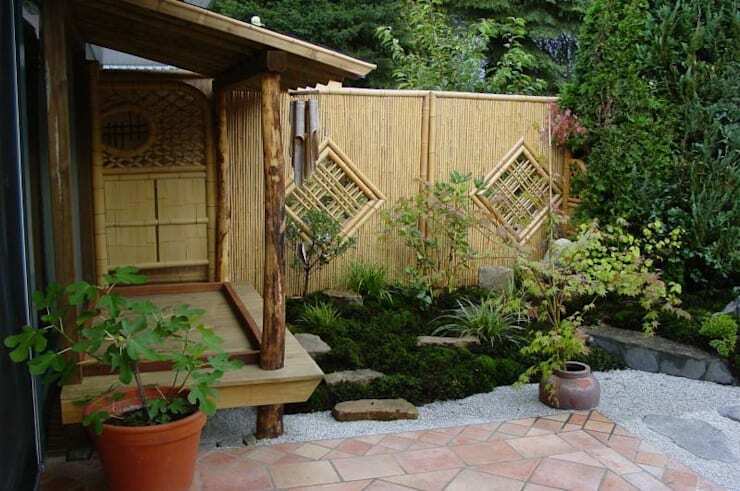 Designing a Japanese moss garden in your small backyard will add an element of surprise in the surrounding of your home. This Japanese garden is designed with a gravel bed and dark green moss covered rocks. It is further decorated with a variety of plants and stylish bamboo wall. Don't miss out on these tips about designing a charming garden. 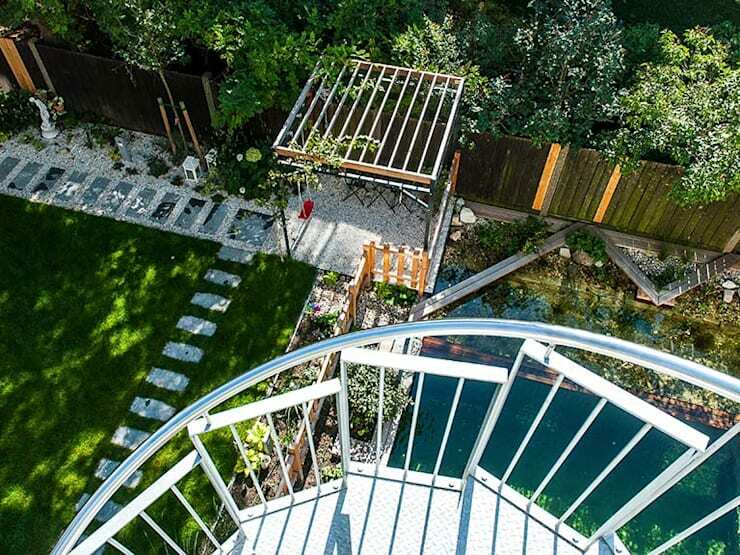 Which of these patio garden designs did you find most interesting?